Puebla | Strike of Lightning! PUEBLA, June 1. – The Popocatepetl had 35 eruptions accompanied by steam and gas and minor amounts of ash, during the last 24 hours, according to the National Center for Disaster Prevention (Cenapred). Also, the federal agency said the vents registered at 03:17, 05:10 and 6:50 hours, as containing large amounts of ash, reached on average a mile high and headed southwest. Between 11:00 and 21:44 yesterday, recorded 9 hours of high-frequency spasmodic tremor and from 08:00 hours on Friday, started a new episode of high-frequency spasmodic tremors and also had segments continuous tremors for 2 hours totaling approximately one hundred. At night, he added, it was observed a slight glow above the crater of the volcano and at the time of this report (11:00 hours), the gas plume was diffuse, between 100 and 300 meters above the crater rim and goes west and southwest, toward Tetela Volcano. PUEBLA, In the last 24 hours, the activity of Popocatepetl “was quite high,” the National Center for Disaster Prevention (Cenapred), reported that at 19:00 pm yesterday it registered an increase in seismic activity of the tremor, which was accompanied by a persistent column of gas and ash, which reached 4 km above the crater and was dispersed by prevailing winds to the northeast. In the report of this afternoon, also highlighted the eruption of incandescent lava fragments, which spewed down the slopes of the volcano, reaching external distances up to a mile, “this activity lasted until 21:56,” he said. At 1:12 am this morning, the volcano showed “another important eruption, again with incandescent lava fragments” and with a plume of two miles high, consisting of gases and ash, according to official data. In this sense, the Cenapred announced that at 4:16 AM another episode of tremors began, with eruptions and expulsion of lava fragments, which ended at 7:02 this morning. In total, the federal agency noted that in the last 24 hours there were a total of 63 eruptions of small and medium size, not including trains mentioned. Therefore, the alert level remains at Yellow volcanic Phase 3. The volcanic alert level Phase 3 is yellow, which means the chance of observing the following scenarios: medium-scale explosive activity at high, dome growth and possible expulsion of lava, explosions of increasing intensity and rains ash on nearby towns notorious and in smaller amounts in more remote populations, depending on wind direction. MEXICO CITY, May 8. – The President, Felipe Calderon, posted on his Twitter account a photograph of Popocatepetl, that on his way to Puebla, the image was a favorite site for photo editing Instagram . In the morning the Popocatepetl registered 26 exhalations of low and medium intensity, the National Center for Disaster Prevention, which warned “high” of volcanic activity. Also reported that the set of seismic activity was accompanied by the emission of a dense continuous plume of water vapor, gas and small to moderate amounts of ash. ﻿Puebla (Mexico), the volcano Popocatepetl more action! Puebla (Mexico), April 21 (EFE). – The Government of Mexico insisted Wednesday that for now no order to evacuate the 28,000 villagers living near the volcano Popocatepetl, near the capital of the country, but no ash emissions have stopped for eight consecutive days. The volcanic alert remains at phase three yellow and is not expected, for now, order the evacuation of the villages near the crater of Popocatepetl, said Interior Minister, Alejandro Poire. The official explained that for now it works in coordination with the states surrounding the volcano to act if necessary, which would occur only if the alert turns red phase one. Poire said the Mexican government has all the financial, logistical and human resources to meet any contingency volcanic. The National Center for Disaster Prevention (Cenapred) reported that in the last 24 hours the volcano has remained the emission of incandescent material that caused the decline of ash in the towns of San Pedro Benito Juarez, Santiago Xalitzintla, San Nicolas de los Ranchos , San Pedro and San Mateo Yancuictlalpan Ozolco. During the course of this day, the emission of ash also reached the eponymous capital of Puebla state where more than two million inhabitants. 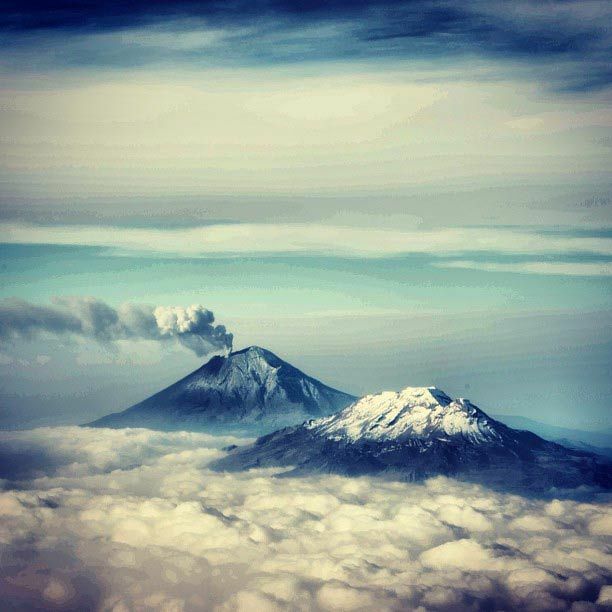 Popocatepetl has produced four exhalations of steam and ash of medium intensity, but subsequently had various segments of high amplitude spasmodic tremor, which lasted for four hours, according to the official volcano monitoring. Puebla’s government has issued recommendations to the ash fall, that continues for eight days, when volcanic activity intensified. The authorities call for cover deposits of water to prevent contamination, cleaning debris from roofs, yards and streets and then deposit them in bags. “The ash can be used for parks, gardens, growing pots, as it is rich in minerals. People should keep animals indoors, never throw the volcanic debris into drains to prevent clogging, cover appliances electronics, to prevent damage, it is also advisable not to perform outdoor activities and keep doors and windows closed, “says an official statement today. Employers have also issued a series of recommendations to their staff not to suspend activities and prevent the health of employees is not affected, and the operation of their machines. “We have turned our partners recommendations for employees who work outdoors use a mouth cover, taking care to avoid damage machinery and properly clean the ash to avoid affecting the pipes of factories,” said President Council of Business Organizations (COE) in Puebla, Luis Gerardo Inman Peraldi. Puebla’s government also said it had not planned to cancel any activity related to the celebration commemorating the 150 anniversary of the Battle of Puebla which has scheduled a parade of 12,000 students.